Polycaprolactone polyols are a special class of polyester polyols preferred in polyurethane elastomer applications where high dynamic durability, broad temperature profiles, very good hydrolysis resistance, and exceptional elastomeric properties are required. Polyester polyols, as a class, are generally selected for urethane applications where high tensile strength and tear resistance, sliding abrasion resistance, flex fatigue resistance, oil, grease and solvent resistance, and high temperature and oxidative stability are needed. Formulators can further enhance these general property sets by the proper selection of the “initiator” diol (see below) used to produce the various grades of polycaprolactone polyols. Hence, the polycaprolactone polyols exhibit a great versatility in the targeted design of polyurethanes requiring demanding performance attributes and service life. In addition to the “initiator” type used, polycaprolactone polyols are offered in a wide range of molecular weights (300-4000), functionalities (diols, triols and tetraols), with low acidity values and polydispersity’s (Molecular Weight Distribution). In contrast, chemists produce adipate polyester polyols by the condensation reaction of a dicarboxylic acid and a diol. Carboxylic acid monomers such as adipic acid, leave residual organic acid moieties which adversely affect properties like hydrolytic stability. Adipate based polyester polyols show acid values in the range of 0.5-1.0 KOHmg/g. Polycaprolactone polyols can achieve impressively low acid values. The standard grades of the polycaprolactone polyols show acid values below about 0.20 KOHmg/g, whereas the low acid value Placcel®T grades have acid values in the range of 0.02-0.05 KOHmg/g. The virtues of the low acid T-grades include greater hydrolytic stability and much enhanced prepolymer viscosity stability on aging. The standard polycaprolactone grades also have very low acid values. They manifest themselves in cast elastomers by exhibiting lower isocyanate reactivities and extended processing times versus the low acid grades. A common issue with adipate polyester polyols, due to their higher acid values, is viscosity creep on aging of their associated prepolymers. Ethylene Glycol: General purpose initiator affording a good balance of properties. Diethylene Glycol: Contributes some polyether performance characteristics. Butanediol: High cut, tear, and chunk resistance; high tensile properties. Hexanediol: High tensile and thermal properties and cut-chip resistance. Neopentyl Glycol: Reduced propensity to crystallize and better hydrolytic stability. The following passage summarizes the general “cold hardening” characteristics of caprolactone polyol-based PURs using the various “initiator diols”. Cold hardening is a significant increase in durometer due to crystallization of the soft segment in the PUR. If the polymerization initiator has a methyl group as a side chain (e.g. NPG), crystallization of the soft block decreases, but strength properties also decrease. As the average molecular weight of the polyol increases, so does the crystallization rate and onset of “cold hardening.” This is particularly true at a molecular weight of 2000 and above. Placcel® polyols with a narrow molecular weight distribution (N grades) exhibited slower crystallization rates. 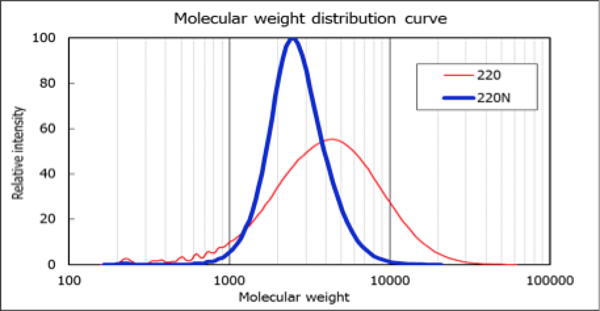 The GPC data below contrasts the narrow molecular weight distribution of an N series Placcel® diol, 220N, with a standard grade of polycaprolactone diol, Placcel®220. The Placcel®220 N exhibits a viscosity of 242 mPa●s at 75 °C and MWD of 1.24; Placcel®220 exhibits a viscosity of 372 mPa●s at 75°C and an MWD of 2.0. By contrast, the adipate diols show broad MWDs, around 2.50, as well as high polyol viscosities. As discussed above, the caprolactone polyols are known to exhibit better hydrolytic stability than their adipate polyester polyol counterparts. 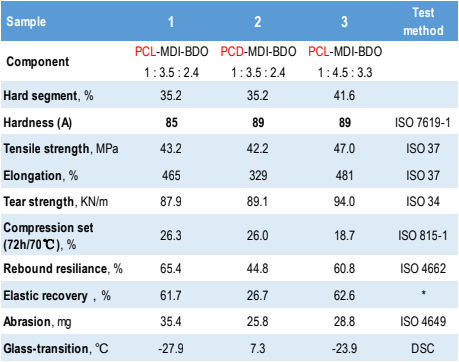 The figure below compares the tensile strength retention of polycaprolactone polyols against other polyol families where MDI-based TPU specimens were soaked in water at 80 °C for three (3) weeks and four (4) weeks. Particularly noteworthy is the high hydrolysis-resistance of Placcel®220 NT (narrow MWD and low acid), having an acid value of 0.02 KOHmg/g. Also shown in the figure are a PTMEG 2000 (*1), a 2000 MW 1,6-HDO adipate (*2) and a 2000 MW HDO type polycarbonate diol (*3) TPUs. The polycarbonate diols are known to exhibit the highest hydrolytic stability because they generate CO2 on hydrolysis without producing an acidic moiety that would autocatalyze further hydrolysis. The N and T series of highly hydrolysis-resistant Placcel® polyols are available through Gantrade Corporation. As already indicated, the polycarbonate diols (PCDs) are a premier polyol for use in polyurethanes, albeit much higher in cost. We prefer to compare our polycaprolactone polyols to the polycarbonate diols in PURs because this comparison best exemplifies the high performance of polyurethane elastomers based on the polycaprolactone series. In the table below, we compare Placcel® 220N, a 2000 MW EG-initiated narrow MWD polyol, with an HDO polycarbonate diol in cast MDI polyurethane. The PCD-based elastomer (sample 2) had higher hardness compared to the 220N-based elastomer (sample 1) with the same compositional hard segment content of 35.2%. Within the same hardness value, the PCL-based elastomer (sample 3) shows much higher resiliency and lower compression set compared with the PCD-based elastomer. Elastic recovery of the PCL-based CPUs were superior when measured by stretching samples to 300 percent elongation at a deformation rate of 500 mm/min. followed by recovery measurements after 10 minutes from the release of the stress. In the figure below, the storage modulus of the same three samples were measured from -60°C to +190°C. In the range of 0°C to 150°C, the storage modulus of the PCL samples 1 and 3 exhibited better stability than the PCD-based elastomer. The high storage modulus of these elastomers is very useful in high load applications. Further, the two PCL-based elastomers showed a lower tangent delta (tan δ) in the TMA, which equates to an elastomer with lower interior heat build-up hysteresis at high speeds, lower rolling resistance, and good wet skid resistance. Their excellent stress-strain properties and tear properties compare favorably with PTMEG elastomers while also exhibiting low compression set and good resiliency. The data supports the conclusion that PCL-based polyurethane elastomers would be the best choice in applications that require excellent dynamic properties, such as use in high-speed rollers and wheels, O-rings and seals, shock absorbers, vibration dampening equipment, and energy management systems. To understand which polyol is best suited for your company’s unique needs, partner with Gantrade. Our team, armed with a wealth of technical knowledge and expertise, can guide you to the best polyurethane solution for your applications. Contact Gantrade today to get started. Gantrade offers a wide portfolio of polyols for polyurethane applications.